Ultan Dillane and Quinn Roux are due to be available this weekend. CONNACHT WILL HAVE to plan without Irish duo Bundee Aki and Jack Carty for this Saturday’s Conference A clash against Ospreys, but they have been boosted by the availability of Quinn Roux and Ultan Dillane. 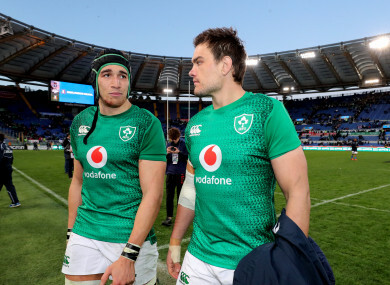 Carty debuted for Ireland in their victory over Italy and was given three minutes when he replaced Johnny Sexton, and with Joey Carbery possibly out for a few weeks with a hamstring problem, the Connacht out-half will remain with Joe Schmidt’s squad this weekend. Aki was withdrawn after 12 minutes last weekend in Rome due to a head injury and he is continuing his recovery from that knock with the Ireland medical team. After the game, Schmidt said Aki was keen to go back to his province for their crucial Pro14 tie at the Sportsground [KO 2.45pm, TG4/Premier Sports], but Andy Friend yesterday confirmed the centre won’t be available. Tom Farrell and Caolin Blade, meanwhile, trained with Connacht on Tuesday and are available for the weekend, but the unavailability of Carty and Aki — although expected — is a blow. “Bundee is always tapping on the shoulder, he wants to play every game. But I believe he took a bit of a head knock there. He has got a HIA to get through,” said Friend. “I’m not saying the other men aren’t, but he is certainly a vital man for Ireland. Given that injury there they will be looking after him. “I was lucky enough to be at Buccaneers on Saturday and all of the talk was on Jack Carty. Meanwhile, in a major setback for the province as they bid to qualify for the Champions Cup, flanker Sean O’Brien has been ruled out for the rest of the season due to a shoulder injury. Friend said O’Brien will be back in time for pre-season training while second row Gavin Thornbury is nearing a return after a similar problem. “Sean is a big loss,” he added. “He has been great when we have been able to get him out there on the park. It’s a big loss and disappointing for him. But it’s important now that he gets that right. We know that the shoulder is not right. Let’s just cut our losses this year and get the surgery and get him right for next year. The plan is it should be about a four-month turnaround for him. It should be ideal to get him back into pre-season. Robin Copeland has also returned to full training this week, but Dominic Robertson McCoy and Niyi Adeolokun remain sidelined. Email “Ireland quartet back for Connacht ahead of crucial Pro14 clash with Ospreys ”. Feedback on “Ireland quartet back for Connacht ahead of crucial Pro14 clash with Ospreys ”.